750ml bottle acquired & brought to the tasting by me, 2004 cork. Poured into Cantillon tulip. Pours a golden yellow color, white head, thin ring, wisps on top. Nose is citrus, funk, wet wood, medium tartness, musk. Flavor is funky citrus, floral, mineral notes, light tartness, perhaps a trace of light hoppy bitterness remains (but not much), oak. The age has smoothed out the dry-hopping and it's really come into its own. Light body, crisp & refreshing, tart dry finish. This is exactly how I like my Cuvee des Champtions/St Gilloise, with lots of age. I don't really enjoy this beer fresh and I think 4+ years of proper cellaring is necessary to really get the most out of this beer. By then, the hops are fading and the funk/citrus can shine through a bit more. Overall, tasting pretty much like an aged Cuvee des Champions, which is just fine by me. From Mike. Who else? Thanks a ton buddy. 750ml unlabeled bottle into Cantillon stemware. Reviewed from notes at a tasting 1/18/14. Pours clear yellow with a thin white head with moderate retention. Spotty lace with little stick. Decent. Nose is oak, apricot, lemon zest, hay, cobweb and yeasty funk. Nicely balanced with a lot of robust flavor. Opens with a surprisingly prevalent hop bitterness. Light lemon zest and yeast with a moderate tartness in the middle. Filmy and tart lemon on the finish with a lemon peel bitterness in the aftertaste. A little awkward but not bad. Light bodied with ample carbonation. Prickly and lively in the mouth and goes down soft and filmy. Finishes clean and mellow with a lightly lingering aftertaste. Really enjoyable. This is a dry-hopped version of Cuvee de Champions... and its honestly not that much different from that beer. The hop bitterness being present is a bit surprising but not all that appreciated. A decent beer but nothing special. Looks like your typical Classic Gueuze, with a touch of haze in the otherwise translucent glowing lambic. Nice! The nose starts with a familiar time as well, though there is a pervasive acetone note that starts strong but fortunately fades over the several minutes durin which I enjoy my glass. There is a bit of hoppy dryness in the nose above the classic Cantillon aroma, which is just so well integrated right now. At first the flavor starts out with a deleterious acetone note, which again fades quickly over the course of my tasting. From there on, this beer becomes fantastic, with a lovely hop bitterness intermingled with lactic, mushroom, and wood. I can dig it - delicious stuff! And of course, as expected, the mouthfeel is smooth and crisp, clinging to the sides of my mouth with nice tannins from the oak. At first, again, the acetone contributes, though this time not in a bad way - a bit slick and almost tacky. This, too, recedes. Overall, I really enjoy how the hoppiness is still so present and contributes wonderfully. Smell: Very grassy, light funk, earth and hay. Bit of cheese, reminds me of 5-year aged Gruyere. Taste: Grass, oak, hay, earth and funk. Overall: Very nice cantillon, good funk, balance and development. Shared by craytonic at our insane sour and wild ale tasting on April 14, 2012. Thanks Matt. The beer is straw yellow and mostly transparent with a small, white head. The aroma brings hay, a bit of cheese, earth, light citrus. The flavor is enjoyable. A pretty simple and straightforward beer. Light on the palate and very easy to drink. I feel very grateful and fortunate every time I get to sample a new beer from Cantillon. Served in a Cantillon tulip. Another great Cantillon tick for me. Beer is yellow and mostly clear. White head. Small and medium bubbles no lacing. Moderate to high carbonation. Aroma is grassy and horse-y. Funky bright lactic. Beer has a light body, dry finish. Old hop flavor. Oily and grassy. It tastes like a c Cantillon that is to say it tastes fine. There is almost a coconut flavor to it. Odd. Good but not great. From 04/14/12 notes. Had at our epic DC Sour Tasting, shared by craytonic; thanks Matt! 2006 vintage. a - Pours a murky golden color with one inch of bright white head and low carbonation evident. s - Smells of sour fruits, light funk, hay, earthy notes, light spice. t - Tastes of funk, cheese, sour fruit, oak, earthy notes, hay. Taste has more funk then the nose. m - Medium body and low to moderate carbonation. o - Overall a pretty nice lambic. Nice funk, especially in the taste, and another nice beer from Cantillon. Would like to have it again. 375mL bottle. 2006 vintage. Big thanks to craytonic for this one. Pours a clear yellow color with a fizzy white head that recedes fairly quickly, leaving some sparse lacing behind. The nose carries some light barnyard and cheese notes. There's a touch of lemon and oak, plus a light hay presence in the background. The body is fairly light with light-to-medium carbonation. Finish is quite dry with light oak and a touch of bitterness on the back end. Cheese and barnyard on the palate, for the most part. Overall, this one was quite nice, though didn't live up to some of the better ones of the evening. Still, this is an excellent beer in its own right, and I'd love to try it again. At a bar like Bier Circus that carries dozens of highly desirable, exceedingly rare beers it can be challenging if not downright impossible for a beer lover to make a selection. In this instance, however, I knew what I wanted months before I walked in the door. When a rarity from Cantillon is available, my mind is already made up. 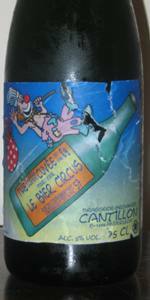 Served in a wonderfully labeled, 375 ml bottle with a hobo-clown riding around all drunkenly on a Cantillon bottle. Awesome. Pours into an appropriate glass a hazy orange-gold with a quickly reducing white, bubbly head. Aroma is immediately funky with powerful brett notes - lemon juice acidity, moldy wood, stale hay, barnyard muck, etc... It also features a more pronounced hoppy floralness. Taste provides a wonderful balance of tart lemons, bready malts, floral hop character, and subdued barnyard funk. Simply sublime. Mouthfeel is muscularly sour up front with a radiant bitterness in the finish. Spritzy and fairly light bodied. Dry. Drinkability is flawless. I would happily session this. It's not easy to find a beer this sour and funky that this drinkable. Bottle (750ml) from Bier Circus - 2004 vintage. Shared for Joe's birthday. A - This is a pretty terrific looking lambic - nice couple fingers of off-white foam that dissipate to a cap and ring. A bit of spotty lacing. Slightly hazed golden color with tons of tiny bubbles racing up the middle. S - Big sourness and vinegar, tons of funky attic, a surprising amount of lemon citrus and floral hop character for a beer that is five years old, some bready malt. T - The taste is a little more muted, with a great deal of tartness, lemon, fresh bread, some funk, a touch of oak and sourness in the finish. It's a little less complex than I was expecting. M - The finish is super-dry, with some nice residual tooth-coating candy sensations. Light-medium body, with light spritzy carbonation - I could have even gone for a few more bubbles. D - Damn. This stuff goes down super-easy. I could kill a 750ml bottle of this stuff no problem. It's not super-different from Cuvee de Champions, but that's not such a bad thing as that's a pretty good beer to begin with. Definitely worth trying/buying if you're in Brussels! In the bottle from the Bier Circus itself, the only place that it is available in all of Belgium. This was enjoyed the night before my best friend went back to France, and I went back to London. Great memories, great beer bar, great beer. Dark golden with a billow offwhite/whiteish head of foam htat lasts and fizzles. Aromas are super funky with cob webs and spiders in the mix as well as brett, wild yeast, bready malt, and dead hops. Taste is all super funky yeast, bread, and refreshment. Mouthfeel is light, dry, spritzy, and acidic/sour. Drinkability is superb. A hoppier, drier, funkier version of their flagship gueuze. Seriously an easy chugging true lambic. Awesome. No longer retired, this beer is a regular (but exclusive) feature at the Beer Circus in Brussels. It is also one of the best lambics I've ever had. 375 ml bottle, cost of seven euros, ABV 5%. An unblended lambic that is fresh hopped, matured, then again dry hopped before bottling. A moldy looking white head. A steady stream of bubbles. A crisp, fruity orange colour. Vibrant colour, not toasty. The complexion is sharp despite some murkiness. Very handsome. The aroma is equal parts hoppy and funky. Fresh toasty malts and wheat. A mellow lambic, the oak evident. The mouthfeel incredibly smooth, an absence of spice and assertive hop bitterness makes for a clean presence. Easily the cleanest drinking lambic I've had. While still funky it is no where near pungent. Not sweet like a faro either, just right. A toasted, roasted feeling to the malts. Tasty caramel malt. Caramel malt and hops, great combo for this style! The hops with a tremendous (and unlikely) presence for the style. Exceptional in every way. One of (if not the) finest lambic I tried on my trip to Belgium. It is super clean, super crisp, and super tasty. If you are fortunate to find yourself at the Bier Circus do consider ordering this. Funny how things work out sometimes. I'm not a regular lambic drinker, but I do absolutely love the stuff from time to time. Recently I've had Cantillon on the brain, and then out of nowhere this rare gem basically falls into my lap. How bout that? Cork reads 2004. This beauty pours a bright, vibrant, peach color with a slight haze to it. The initially large head (especially for a lambic) fades and settles into a thin layer of foam. Smells outstanding. Traditional lemony tartness, raw wood, and a heavy, sweaty, naturalness - aka barnyard. Almost a whisp of a sweet smelling, flowery hop. I'm pretty stunned by this beer at the moment, it's just so good. Complex with out being excessive. Agressive and gentle at the same time. Begins with an initial tartness, plenty of lemon rind and appleskin. Tastes the way freshly cut grass smells. Wet wood, dust and must, and a slightly sweet floral quality. Follows up rich and doughy, with that wild yeast in full effect. The texture of this beer really brings it all together. Lightly carbonated, but so soft and bouyant. Starts off lush and ends a bit dry. I realize I'll probably never have this beer again. Maybe it's better that way, I'll remember it more. This is really a pretty amazing work of art here. So natural. Everything I'd expect from Cantillon, one of the world's classiest, yet fun, breweries. This beer was brewed especially in celebration of the closure of one of Brussel's great beers at its original location -- Bier Circus at 89 Rue de L'Ensignment. The proprieters were kind enough to sell me a bottle to go after I so enjoyed the glass I had in their bar. Bottle displays a happy hobo-esque clown straddling a giant, rocket-like beer bottle. The clown has slung over his shoulder a knap-sack containing several bottles of what are no-doubt quality Belgian ales. The bottle itself reads "The Derniere/ Laatste Cuvee du Van 89 Pour/Voor Le Bier Circus Rue De L'Ensignment/Onderrichtstraat 57." The beer itself is unremarkable in its appearance. Slightly hazy yellowish/orange, with a head that starts off fizzy but moderate in size, and quickly fades to an array of thin wisps. Nose is hoppier than is typical for Cantillon brews, but this is sensible given that this particular beer is made with fresh hops, and dry-hopped to boot. Tettnang hops lend a floral aroma that compliments the typical tart lambic scent nicely. Overall impression in the mouth is quite round. Muted peachy flavors combined with standard barnyard funk. More hop surprises here, with a bit more spiciness in the finish than is typical for the style, and a slightly increased bitterness. Quite a dry finish. Generally light in the mouth, with a pleasant, even carbonation. It would be very, very easy to drink an awful lot of this. If only there were an awful lot of it to drink!